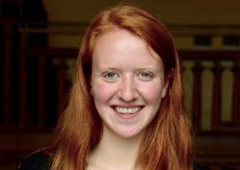 Sophie Zinser ’16 has been selected for membership in the Schwarzman Scholars Class of 2020, located at Schwarzman College in Tsinghua University, where she will study China’s growing influence on foreign aid. Sophie Zinser ’16, deputy director of Syria Direct in Amman, has been selected as a Schwarzman Scholar, one of the world’s most prestigious graduate fellowships, located at Schwarzman College at Tsinghua University in Beijing. This Schwarzman Class of 2020 is only the fourth in the program’s history, with 147 Schwarzman Scholars selected from over 2,800 applicants. 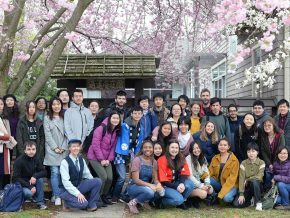 The class is comprised of students from 38 countries and 119 universities, with 40 percent originating from the United States, 20 percent from China, and 40 percent from the rest of the world. The Class of 2020 will enroll in August 2019. 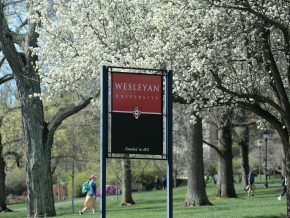 At Wesleyan, Zinser double-majored in the College of Letters and French studies. 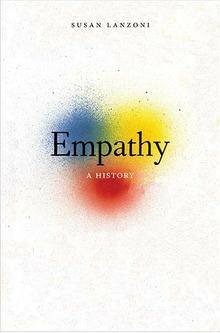 She cofounded the Wesleyan Refugee Project, and following graduation, Zinser worked on a congressional campaign in Minnesota and in international development with the International Rescue Committee’s Emergency Team in New York. Last year on a Fulbright scholarship to Jordan, she led innovative research on safety risks to rural and refugee women. In her current role with Syria Direct, she manages a team of Syrian and foreign journalists in Amman and leads the media nonprofit’s expansion. At Schwarzman College, Zinser will study China’s growing influence on foreign aid. 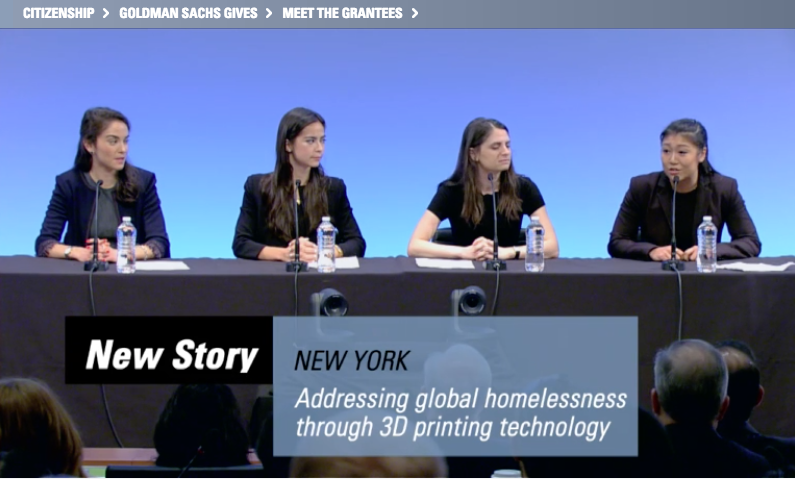 Ellen Paik ’16 (right) speaks to Goldman Sachs CEO Lloyd Blankfein and the Partnership Committee on behalf of New Story, a nonprofit organization that seeks to address global homelessness through the development and application of 3D printing technology. 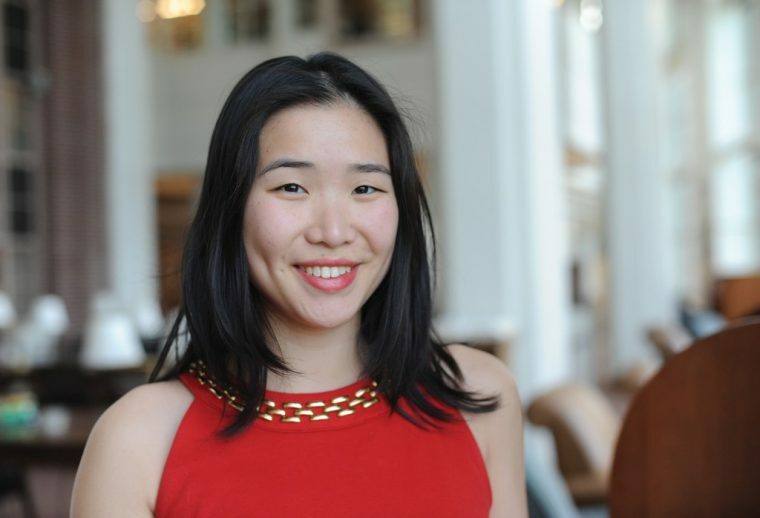 Ellen Paik ’16, an analyst at Goldman Sachs, teamed up with three colleagues to pitch New Story, an organization working on developing low-cost housing solutions via 3D printing technology, to Goldman Sachs’ CEO and Partnership Committee as part of the Analyst Impact Fund, a global firmwide competition. The prize: a grant to the finalist teams’ selected nonprofits. The event was broadcasted live online on Yahoo Finance (see Paik’s team come in around 38 minutes). 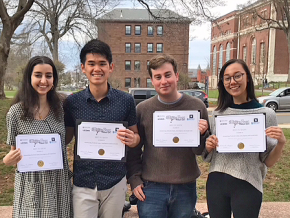 Paik’s group placed second in the global finals and earned New Story $75,000 in support of the organization’s 3D printing initiative. The grant will go towards building the very first complex of 3D printed homes constructed by a nonprofit, in El Salvador by 2019. 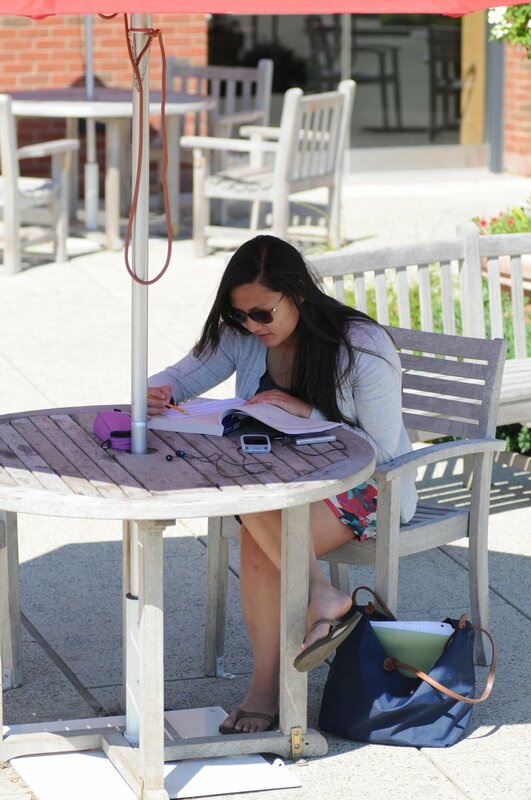 Melissa Leung ’16 is 1 of 75 Americans selected to participate in the 2018–2019 Congress-Bundestag Youth Exchange (CBYX) for Young Professionals, a yearlong fellowship for study and work in Germany. CBYX for Young Professionals provides opportunities for youth to collaborate, interact with new people and new ideas, and, ultimately, to become better global citizens and better leaders. The program annually provides scholarships to 350 Americans and also brings 360 Germans to the United States. While in Germany, Leung will attend a two-month intensive German language course, study at a German university or professional school for four months, and complete a five-month internship with a German company in her career field (foreign aid). Participants are placed throughout Germany and have the opportunity to learn about everyday German life from a variety of perspectives. Funded jointly by Congress (through the U.S. Department of State’s Bureau of Educational and Cultural Affairs) and the German Bundestag, the CBYX program is a unique opportunity for young Americans to enhance their professional skills, as well as broaden their political and cultural awareness by experiencing life in another country. Leung will act as a citizen ambassador of the United States, helping to promote a positive image of the U.S. abroad and creating lifelong friendships and professional connections that will keep German-American relations strong for years to come. Participants must be U.S. citizens between the ages of 18–24, and have clear career goals and experience in their professional fields. Young professionals in STEM, business, agricultural, and vocational fields are especially encouraged to apply, though candidates in all career fields are eligible. 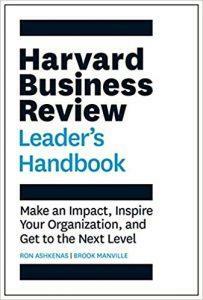 This year more than 600 young professionals vied for a place in this prestigious program. Graduate student Melissa Luna; graduate student Jordyn-Marie Dudley; Keenan Golder MA ’13; graduate student Reid Perkins; Ben McKeeby MA ’17; and Kristen Luchsinger MA ’17 recently attended the Lunar and Planetary Science Conference in Texas. 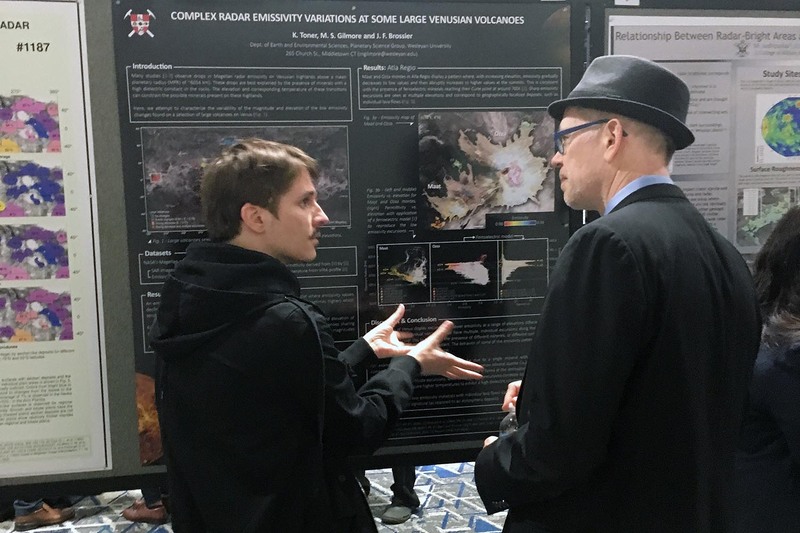 Faculty, graduate students, and alumni attended the 49th Lunar and Planetary Science Conference March 19–23 in The Woodlands, Texas. 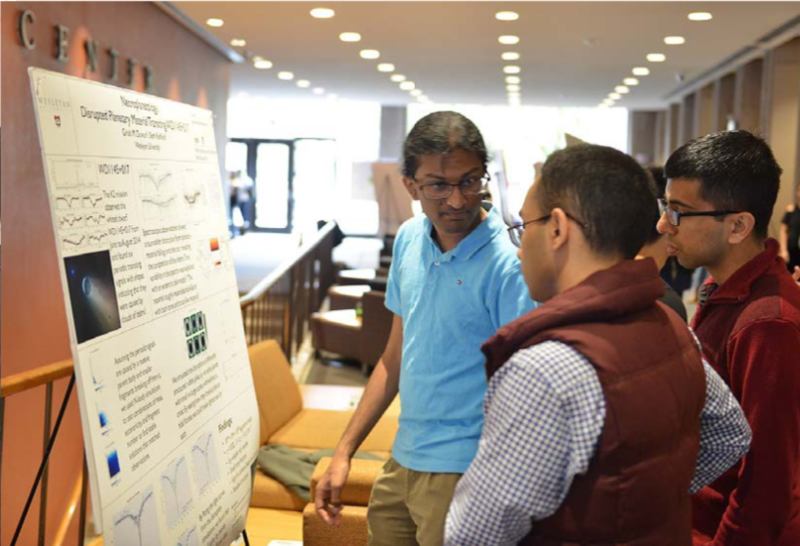 Three graduate students were awarded funds from the NASA Connecticut Space Grant that allowed them to travel to this meeting. 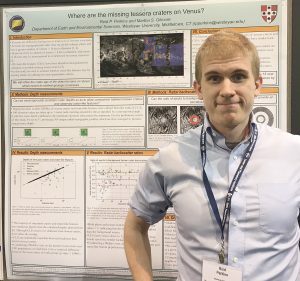 Earth and environmental sciences graduate student Reid Perkins presented a research poster titled “Where Are the Missing Tessera Craters on Venus?” Perkins’s advisor is Martha Gilmore, the George I. Seney Professor of Geology, professor of earth and environmental sciences. 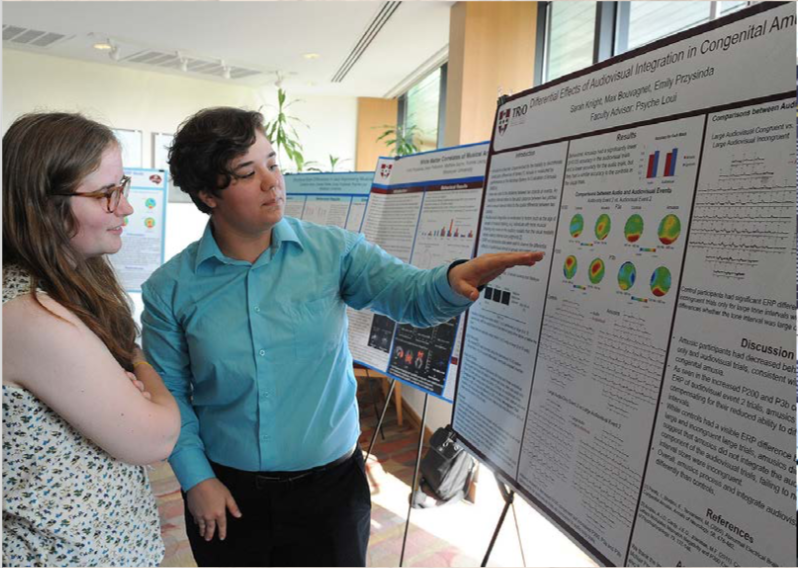 Earth and environmental sciences graduate student Melissa Luna presented a poster titled “Multivariate Spectral Analysis of CRISM Data to Characterize the Composition of Mawrth Vallis.” Her advisors are Gilmore and Suzanne O’Connell, professor of earth and environmental sciences. Earth and environmental sciences graduate student Jordyn-Marie Dudley presented a poster titled “Water Contents of Angrites, Eucrites, and Ureilites and New Methods for Measuring Hydrogen in Pyroxene Using SIMS.” Dudley’s advisor is Jim Greenwood, assistant professor of earth and environmental sciences. 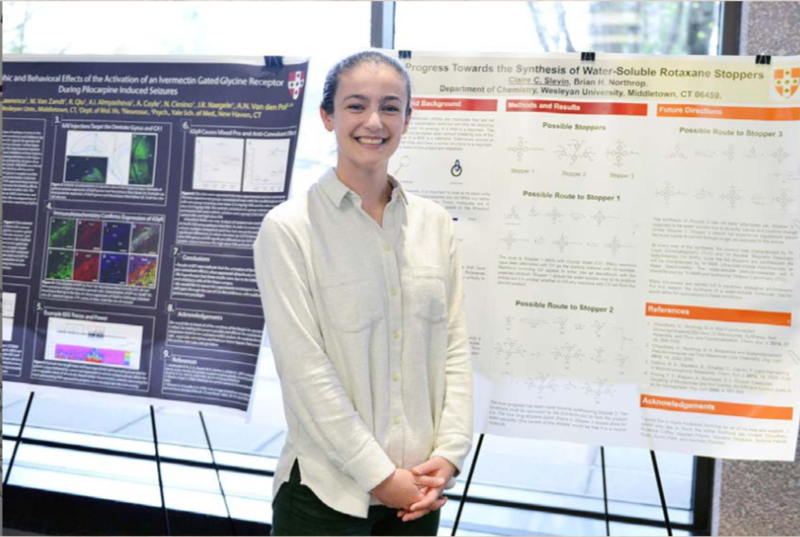 Gilmore also presented a study at the conference titled “Formation Rates and Mechanisms for Low-Emissivity Materials on Venus Mountaintops and Constraint on Tessera Composition.” In addition, she worked with NASA scientists on issues related to Venus exploration. The following alumni authored abstracts presented at the conference: Avram Stein ’17; Jesse Tarnas ’16; Peter Martin ’14; Nina Lanza MA ’06; Ian Garrick-Bethell ’02; Robert Nelson MA ’69; and William Boynton ’66. Keenan Golder MA ’13; Ben McKeeby MA ’17; and Kristen Luchsinger MA ’17 also attended. Wesleyan co-authors published a paper titled “The Stories Tryptophans Tell: Exploring Protein Dynamics of Heptosyltransferase I from Escherichia coli” in the January 2017 issue of Biochemistry. The co-authors include chemistry graduate student Joy Cote; alumni Zarek Siegel ’16 and Daniel Czyzyk, PhD ’15; and faculty Erika Taylor, associate professor of chemistry; Ishita Mukerji, the Fisk Professor of Natural Science, professor of molecular biology and biochemistry. Their paper investigates the intrinsic properties of Tryptophan amino acids found within the protein, Heptosyltransferase I, to understand the ways this protein moves during catalysis. Understanding the movement of this protein is an important step in developing its inhibitors. When this protein is inactive, either because it was genetically altered or inhibited, hydrophobic antibiotics become more effective, so inhibitors could be useful in reactivating antibiotics that are current not effective against these bacteria. While it is popularly believed that inhibiting a protein requires a compound to compete with the substrate, their paper argues that instead one can design a inhibitor to disrupt protein dynamics, preventing activity. The co-authors compare the function of this “protein dynamics disruptor” to a wedge holding open a door–once inserted, the inhibitor prevents the protein from performing its function. Their research on Tryptophan residues also found that distant regions of the protein communicate whether or not they are binding their substrate to other regions. “It would be like if your right hand knew that your left hand was holding a pencil just by the changes in the position of your left hand. 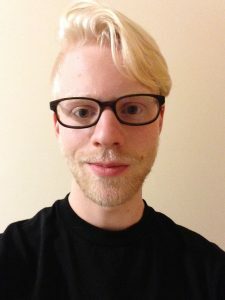 We are currently pursuing computational studies to look for these motions via molecular dynamics experiments,” Taylor said. 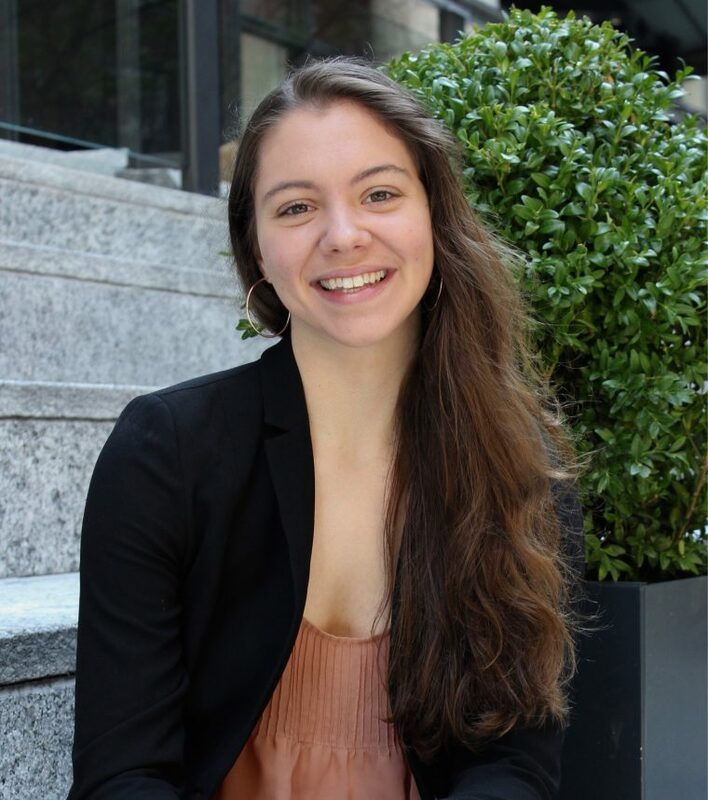 Becca Winkler ’16 launched “Walking Elephants Home,” a project that provides a new model of tourism, and has been nominated for a European Outdoor Conversation Association grant. “Walking Elephants Home,” a Mahouts Elephant Foundation (MEF) project launched and run by Becca Winkler ’16, has been nominated for the European Outdoor Conservation Association (EOCA) grant—and voting is open until March 23. Winkler, a Feminist, Gender and Sexuality Studies major who first began working with elephants in Thailand as an undergrad, wrote her thesis on “Walking with Giants: Eco-feminist Insights on Elephant Tourism in Thailand.” She received a Patricelli Center for Social Entrepreneurship grant in 2016 that helped her launch and run “Walking Elephants Home” through the MEF, a nonprofit that supports elephants and their mahouts (owners) in Thailand. Collaborating with indigenous people, the MEF offers a successful business model with ethical tourism alternatives to those who free their elephants. Their goal is to not only improve the elephants’ well-being by returning them to their natural habitat but also enhances biodiversity and prevents further deforestation. Recent Film Studies graduate Ani Acopian ’16 has been nominated for the “Snapchatter of the Year” award, presented on behalf of The Shorty Awards. Created to honor the best of social media by recognizing those with an influential and significant presence, The Shorty Awards draws nominees from sites such as Facebook, Twitter, YouTube, Tumblr, Instagram, Snapchat and more. Acopian gained significant Snapchat clout with her colorful snaps, specializing in narrative pieces, branded content, and music videos. Some of her work featured in her Shorty Award profile include turning the famous Angkor Wat into a real life Temple Run, and creating content for the healthy restaurant chain Sweetgreen. Acopian’s videos can be viewed on her Shorty Award profile, and be sure to vote for Acopian everyday until voting closes, Feb. 16. On Dec. 7, 14 members of the Class of 2017 were inducted into Wesleyan’s Gamma Chapter of Phi Beta Kappa Society, the oldest national scholastic honor society. To be elected, a student must first have been nominated by the department of his or her major. He or she also must have demonstrated curricular breadth by having met the General Education Expectations, and must have achieved a GPA of 93 and above. The students in this particular group have GPAs of 93.47 and above and have already met all their undergraduate requirements. Former student-athlete Jack Mackey ’16 was named a recipient of the Sport Changes Life Victory Scholar Program. Victory Scholars are “driven young athletes who spend a year mentoring young people through sport in communities in Northern Ireland and Ireland, while studying for their Masters degree and continuing to play the sport they love.” This year, 23 scholars will embark on a life-changing experience of community outreach initiatives, and academic and athletic fulfillment to help mold the lives of young people and enable them to develop a global perspective. With the help of The Rory Foundation, the Victory Scholars program will send its scholars to Belfast, Northern Ireland for two weeks of training. 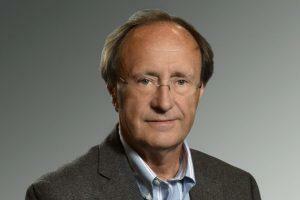 Mackey will then take his place at the prestigious Letterkenny Insititue of Technology in Donegal, Ireland. Film studies major Adam McGill ’16 screened his short film Punked! at the Princeton Student Film Festival this summer. 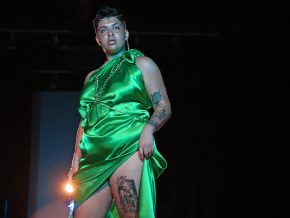 McGill’s comedy is about a punk rock singer and guitarist named Dale, whose allegiance to his music is challenged when a new romance enters his life. Since graduating in May, McGill worked on small sets in the New York City area and he’s currently interning at Sony Pictures Classics, a film distributor, working with their marketing team. Punked! also will be playing later this September at the Golden Door International Film Festival in Jersey City, N.J. View his film online here.